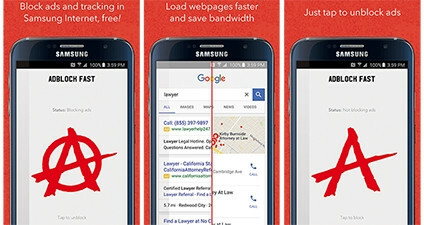 Adblock Fast says use of the app will load Web pages on mobile 50% faster on average. Samsung is today rolling out an over-the-air update that will allow smartphone users to block adverts when browsing the Internet. Adblock Fast is the first free and open source ad-blocker on this platform. Ad-blocking software use has been growing on desktop computers, led by 'techies' and early adopters, but until September last year, was not available on mobiles. Last year, Apple introduced content-blocking software to iOS, amid fears it would have a negative effect on publishers that rely on mobile advertising revenue. However, consumers continue to choose to download the software as these tools help Web pages load faster on mobiles, by stripping out scripts and trackers used to serve up the ads. Also, browsing the Web with fewer ads means users will use less mobile data. "Adblock Fast for Android runs just seven optimised filtering rules as on other platforms and, as a result, Web pages in Android load an average of 51% faster according to our benchmarks," says Brian Kennish, one of the creators of Adblock Fast, in a blog post. To make use of Adblock Fast, users will first have to download the Samsung Internet browser, version 4.0 or higher. Samsung Internet is available to all Android users through Google Play. Users will then have to download Adblock Fast by opening the app, pressing help, and following the instructions to turn ad-blocking on. To unblock ads afterwards, press the Adblock Fast button in the app. With regards to the negative effect on mobile advertising, Wayne Wilson, head of Twitter ad ops at Ad Dynamo, said last year when Apple introduced ad-blocking software to iOS that, "Advertisers and publishers alike face constant challenges and the limitations being created are only forcing them to become more creative in the design and delivery of advertising. With this is mind, the future of advertising online is bright. In fact, it's going to become more exciting and more measurable." Adblock Fast is available for download from the Google Play store.